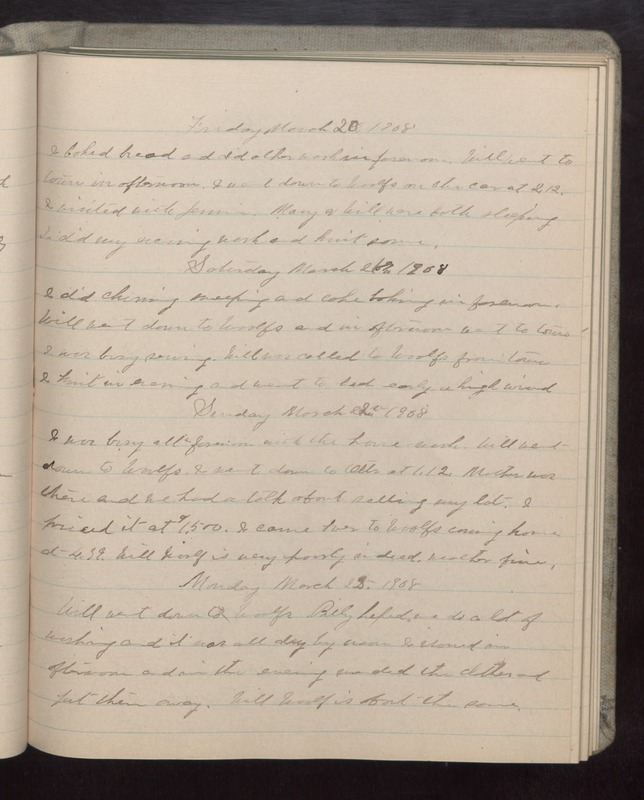 Friday March 20 1908 I baked bread and did other work in forenoon. Will went to town in afternoon. I went down to Woolfs on the car at 2.12. I visited with Jennie. Mary & Will were both sleeping I did my evening work and knit some. Saturday March 21 1908 I did churning sweeping and cake baking in forenoon. Will went down to Woolfs and in afternoon went to town. I was busy sewing. Will was called to Woolfs from town I knit in evening and went to bed early. a high wind. Sunday March 22 1908 I was busy all forenoon with the house-work. Will went down to Woolfs. I went down to Otts at 1.12. Mother was there and we had a talk about selling my lot. I priced it at $1,500. I came over to Woolfs coming home at 4.39. Will Woolf is very poorly indeed. Weather fine. Monday March 23 1908 Will went down to Woolfs. Billy helped me do a lot of washing and it was all dry by noon. I ironed in afternoon and in the evening mended the clothes and put them away. Will Woolf is about the same.